A Rainbow of Friends by P.K. 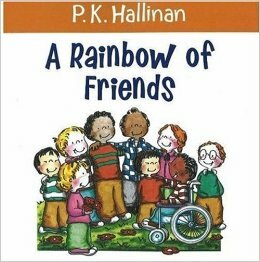 Hallinan is a children's book celebrating the differences of all of our friends. The book describes differences of people we may interact with as a rainbow of friends. The author compares differences to the different colors of a rainbow. Throughout the book friends having many different characteristics are portrayed and then celebrated. The author does not just celebrate different skin or characteristics, he celebrates different ways of thinking and doing. The quote, "But all friends are special and add in some way to the richness of life- how we think, what we say," is a powerful example of how this book truly celebrates having a "Rainbow of Friends." The author explains several times that although we may all be different and bring different things to the table, this a positive thing. He also promotes acceptance when he writes, "And though we may wander a bit wide or far, our friends still accept us the way that we are." This book is characterized as an Element 2 book. The book fits this element because it discusses many different characteristics, and the differences are celebrated. This book explains how having different friends who can do different things is a positive thing, and breaks down the stereotypes of differences being negative. Element 2 is supposed to promote a climate of respect and this is definitely seen in the book when all of the different friends are playing together and accomplishing things together, no matter if they look or act alike. This book also fits this element because it discusses the benefit of having all different friends or people in your life with different characteristics. It mentions, acceptance, easing our minds, adding to the richness of life, caring, and other things that come with having diverse friends. It sends an overall positive message of diversity and acceptance of people that are different from ourselves. One way that this book could be used in a classroom is when discussing personal characteristics. The teacher can read the book and then have the students write down or draw all of the things that make them who they are and what makes them happy. This can be done on a large cut out of a person to make it more realistic. The class can then go around and initial on each others drawing which characteristic that they share. By doing so, the class will realize that they have a lot of similarities even though they may appear different on the outside. This is one way to also celebrate differences because even though they may not have the same characteristics, they will still see how they benefit each other in a classroom and school community.